The sixth day of the Poor Boyz Jib Jam got off to a bit of a later start, giving everyone some much needed rest. 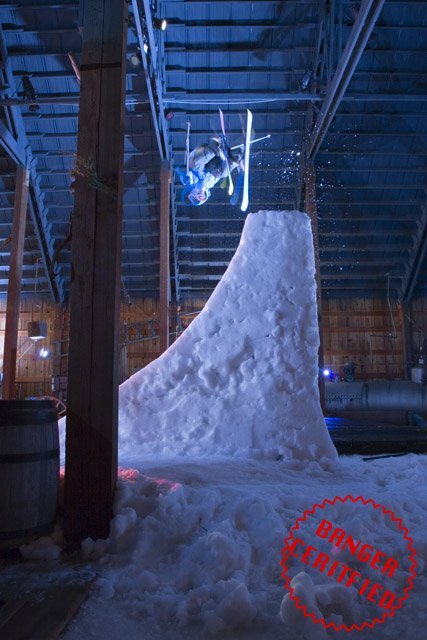 While most of the athletes and media scraped together breakfast, Pete Alport zipped around orchestrating a road gap set to go off before a much-anticipated night shoot on &ldquo;Stella,&rdquo; a quarter-pipe inside an antique-style barn at the bottom of Schweitzer&rsquo;s Stella chair. Mike Wilson and his gap. 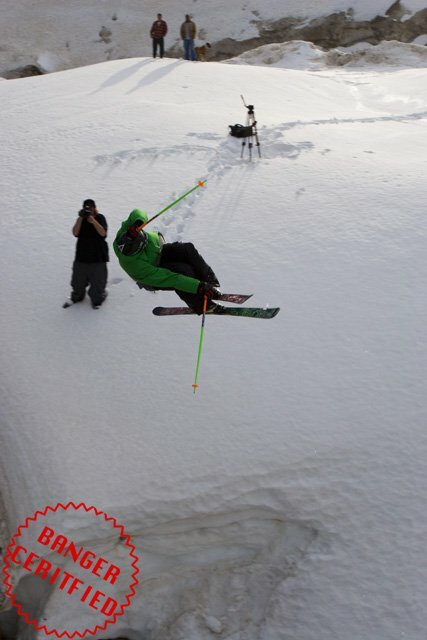 It was Mike Wilson&rsquo;s first day back on skis after his concussion, and when the crew finally gathered to check out the road gap, he was meticulously shaping the kicker&rsquo;s lip in the afternoon sun. The atmosphere at the gap was more like a pool party than a ski shoot, with shirtless athletes and lawn chairs abound, everyone enjoying the warmest day yet. 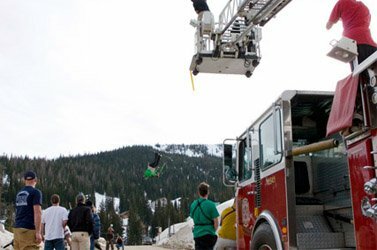 While everyone was waiting for Wilson to give the jump his blessing, Mike Henitiuk decided to climb 50-feet up a tree as LJ Strenio and Christian Sirianni threw snowballs at him. Eventually deciding that his piece of lumber wasn&rsquo;t cutting it, Henitiuk shimmied down and switched trees, clambering well over 100-feet up his new choice. I&rsquo;m not coming down until I get a Ferrari, a lifetime subscription to Hustler, and X-Men comic #1! More eyeballing went into this feature than any other, and after some final adjustments Kyler Cooley ripped his sled down the narrow road to see how fast he could tow, and before long we were ready for action. 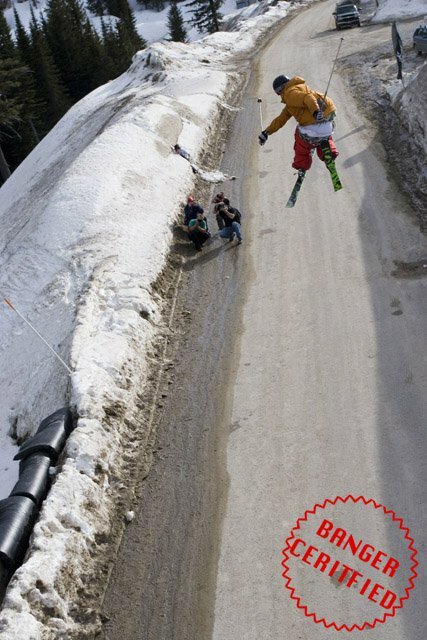 Wilson&rsquo;s notorious reputation and the sight of his potential carcass flying into the jump at 70 m.p.h. had everyone on edge, but he proved yet again that he doesn&rsquo;t mess around. After three speed checks Wilson rocketed down the in-run yet again, and for a split-second it looked like he considered throwing on the brakes, but he went for it, floating over 100-feet onto his back and emerging unscathed to the delight of the large crowd. In front of every phone, camera, and video camera in the house, Wilson decided to go with a Misty 7 second hit, sticking it clean. 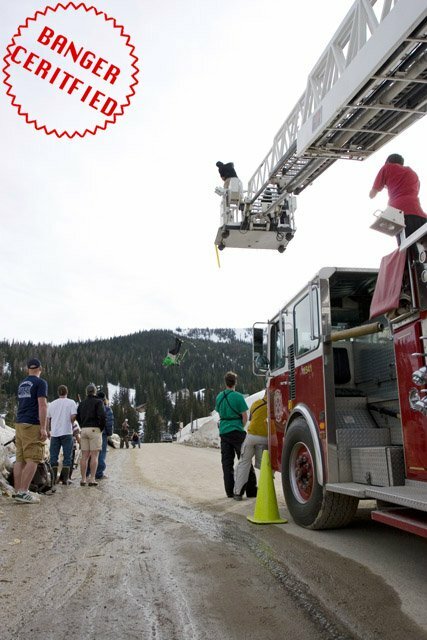 After a third jump and successful landing, the local fire department rolled up a fire truck, raising the ladder for a few lucky photographers and filmers. Simultaneously, Alport and Henitiuk decided to climb Henitiuk&rsquo;s tree, and they proceeded to cut down some branches to get the shot, once again well over 100-feet up. Wilson&rsquo;s fourth jump was an over-rotated double backflip, and after crashing onto his back, he decided to go with another Misty 7, this time flying at least 120-feet. Calmly letting everyone know that he missed his grab, Wilson went right back up and landed it clean. Not nearly finished, he also proceeded to stomp a huge frontflip and a classic Lawn Dart. A lot of riders came out wearing ski boots, but the only other rider to consider the gap was LJ Strenio, who was heading back to school the next day. With Wilson advising from the sidelines, Strenio hit the jump after a few speed checks, and on his fifth try managed a massive Critical 3. Strenio over-rotated another 3 to a failed 5, and everyone thought the show was over. Surprisingly, Wilson suited up for another three hits, busting out a couple of clean Misty 7&rsquo;s. On his fourth try he went for a Misty 5, crashing and breaking his ski, and the shoot was finally a wrap. 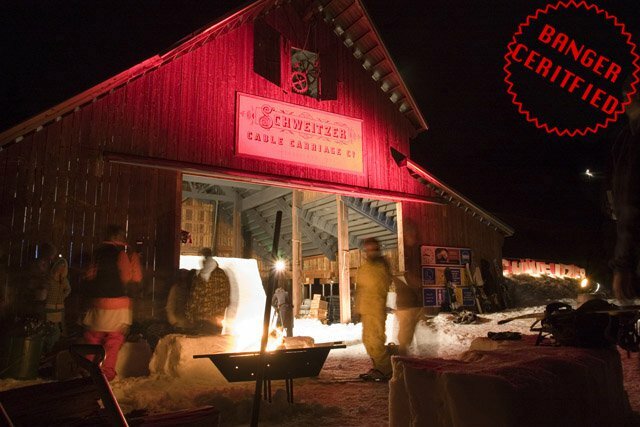 In the evening everyone rode an old snow cat over to Schweitzer&rsquo;s back bowl for another night shoot. The slow machine and damp gear made for a tropical ride, but eventually everyone made it, including the returned John Spriggs and Matt Walker, as well as newcomer Anna Sagal. Pete Alport selects his perch. Stella is six-pack chair that loads in a rustic &ldquo;Schweitzer Cable Carriage Co.&rdquo; barn filled with antique farm equipment and machinery. 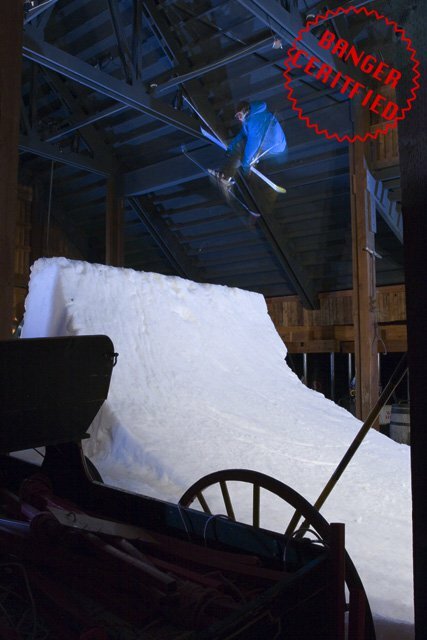 Antlers decorate the walls, and the voice of Johnny Cash serenaded the crew as they shaped the unfinished quarterpipe. Due to the limited lifespan of the feature, nothing got started until every light, strobe, photographer and filmer was in place. With the riders forced to hike for the first time all week, only the White Stripes and the crackle radios broke the silence. 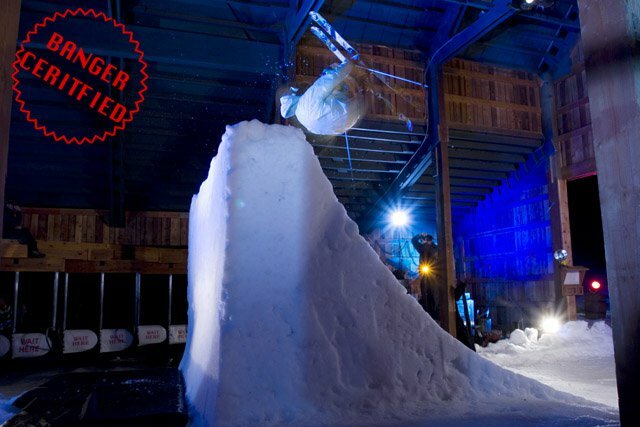 Most of the athletes started small, but soon many were trying handplants, with Henitiuk and Walker finding some success. Pete Alport was in the barn&rsquo;s rafters, raining down curses every time a rider messed up a plant and took a chunk out of the delicate lip. Henitiuk started breaking out a few clean flairs, but most of the other riders were airing to the deck of the pipe and at odds with Alport over the restriction on what they could and could not do. To be fair, Pete put a lot of work into Stella, and the aesthetics of the setup were great. It seemed like he had been hoping for more than some good photos, and was justifiably disappointed. In what may or may not have been a show of defiance, Christian Sirianni and Cody Albino played within the rules until they were the only riders left. Sirianni repeatedly attempted a switch frontflip, and Albino worked on a backflip, taking large chunks out of the lip every hit, to the delight of the protesting riders. Anything but malicious, Sirianni and Albino&rsquo;s shenanigans were a reminder to everyone that skiing is first and foremost about having fun. 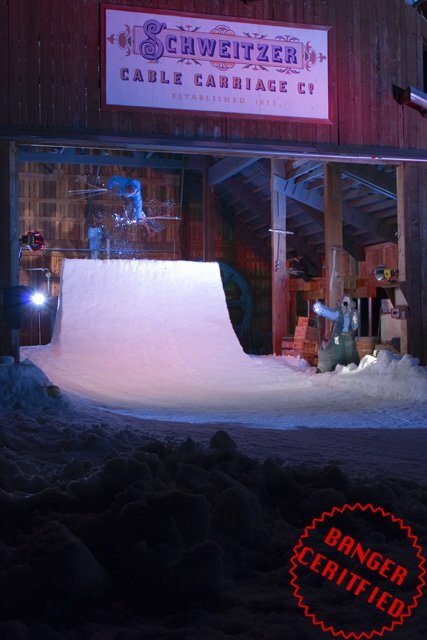 Eventually Sirianni landed his switch frontflip, and handplants were allowed again, but by that time many of the riders were over it. Ben Moxham continued to ski well, and Paco Garcia and Matt Walker also persisted. With the wind blowing and fireworks popping, the first load of riders made a break for the cat. When it reached the halfway point of its journey everyone piled out and raced off down the cat road. 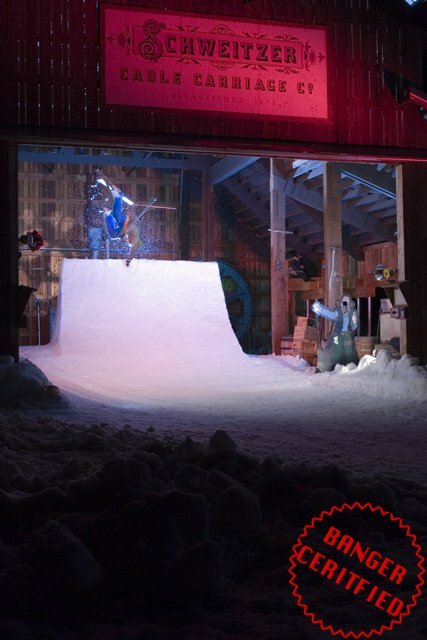 Braving chewed up snow in the dark, the crew of riders raced towards the base area, guided by the light of the moon.